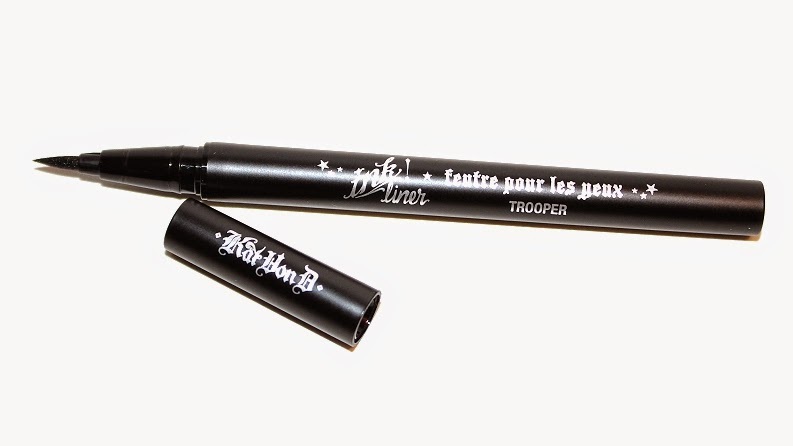 Kat Von D Ink Liner (0.02 oz) retails for $18 USD ($23 CAD) and is said to be "a super-rich and waterproof, felt-tip liquid pen eyeliner for instant drama and effortless bold definition." * Trooper is described as an ultra black. 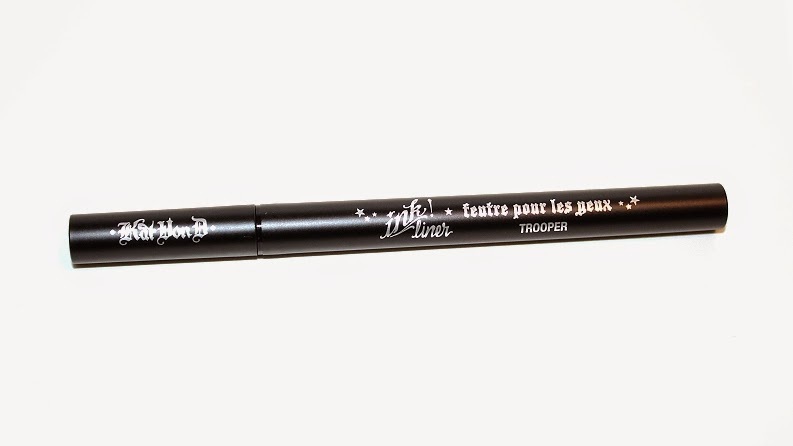 "Get a killer line every time with this ingenious felt tip liquid eyeliner. The innovative, no-fray marker tip holds the maximum level of formula, giving you bold lines with instant lay-down and stunning intensity. Remarkably easy to use, the felt tip applicator provides total control for effortless eye lining. Rock your look around the clock with an ultrablack, waterproof, long-wearing formula that delivers a fade and run-resistant finish. For effortless drama, put it in ink." 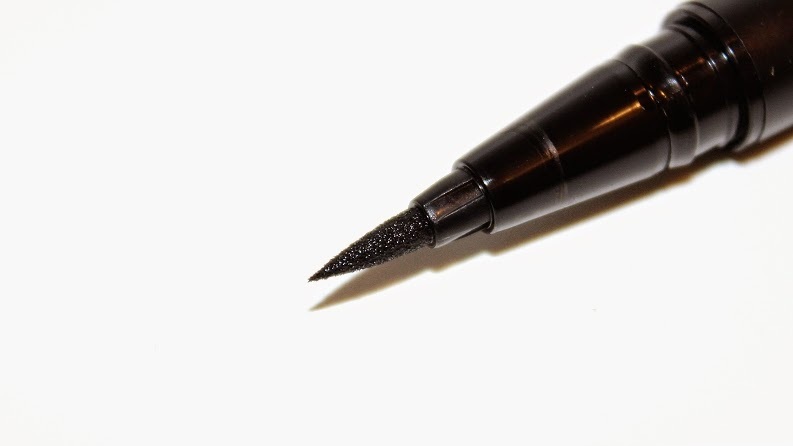 The packaging is a standard black pen style liner with a tapered felt applicator. The tip comes to a very fine point making it easy to apply, define and draw precise lines. Winged liner and detailed work are simple whether you're creating small lines, thick lines or anything in between. The formula is a liquid and it sets 10-30 seconds after application. Once the liner sets it becomes budgeproof, smudgeproof and doesn't bleed, run or fade until you're ready to remove it. 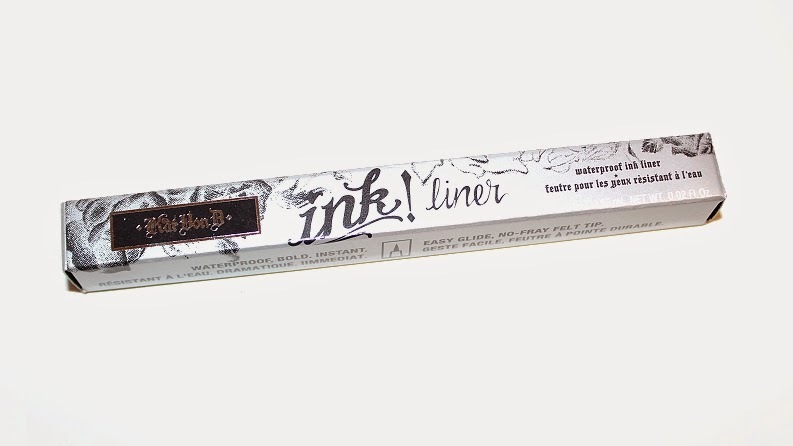 The liner glides-on evenly and doesn't tug or pull at skin when applying. 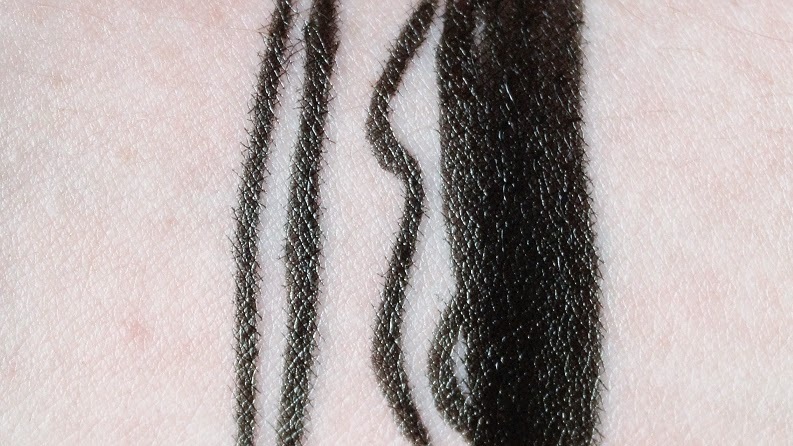 It does tend to feather slightly but it can be layered so any tiny lines and imperfections disappear into a solid, bold line. The pigmentation is incredible; a rich, true black. It had full color payoff in a single swipe and the liner held up for +9 hours before cracking and showing faint wear around the edges. Like most liquid eyeliners, this pen does need to be shaken before use. Nothing extreme, just a quick 3-5 second shake and you're good to go. Otherwise the formula may become watered down and less pigmented. I've never been one for pen liners because more often than less, you hear about how quickly they tend to dry out. I've used this liner on many occasions (+10 times) and it hasn't separated or dried up. Even the felt tip applicator holds up, it looks the same as the day I opened the product for the first time. If you've never used a pen style liner before they are surprisingly a little difficult at first. They do take some practice but once you get the hang of it, liner has never been so easy. It truly is like drawing on your face! 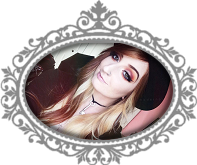 Overall, the Kat Von D Ink Liner is a great product. It is pigmented, easy to use, versatile, long-lasting and it doesn't dry out after the first couple uses – which was my biggest fear. Compared to other brands and it's overall performance, this liner is a great bang for your buck! I highly recommend checking it out, especially if liner a staple in your routine. Big thanks to Remika M. who recommended this product to me!